All lovers of all things that are great, rejoice! Rejoice! For there is finally justice in the world. 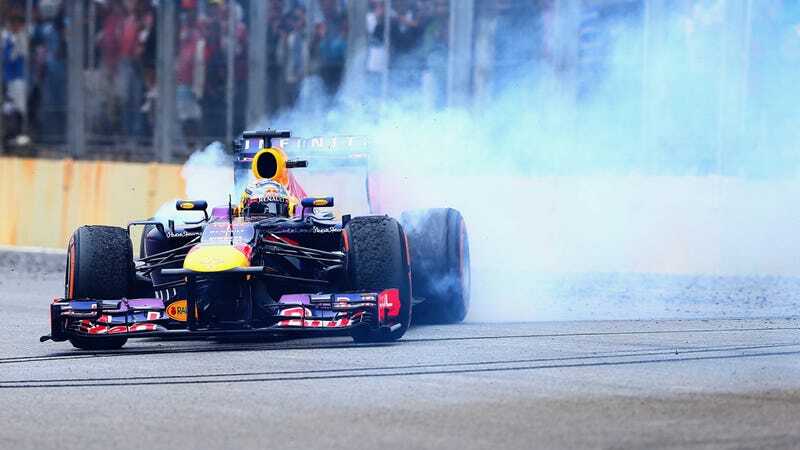 Celebratory donuts are now permitted in the mercurial realm that is Formula One. But only for the race winner. Last year, the eventual season champ and winner of a ridiculous number of races, Sebastian Vettel, decided to light up what was left of his tires at the end of a few of his wins, starting with the Indian Grand Prix. This is because donuts are a traditional, right, and proper way to celebrate anything in the world. I did one once because I had a particularly good sandwich. For his troubles, Vettel was given a fine each time, beginning with a €25,000 one. Fun. After receiving the end-of-race signal all cars must proceed on the circuit directly to the post race parc ferme without any unnecessary delay, without receiving any object whatsoever and without any assistance (except that of the marshals if necessary)," reads 43.3. - Is performed safely and does not endanger other drivers or officials. - Does not call into question the legality of his car. - Does not delay the podium ceremony. "Any classified car which cannot reach the post race parc ferme under its own power will be placed under the exclusive control of the marshals who will take the car to the parc ferme. Finally, an F1 rule change that doesn't leave everyone scratching their heads. I would congratulate Sebastian on his wonderful legal win, but rather, I think we should congratulate F1, and further than that, all of humanity. This is a great leap for all of us.